This great chicken recipe from Chesnee, SC uses fresh vegetables and herbs to give a nice aromatic character to the dish. Mix well the flour, black pepper, salt, paprika, onion powder, granulated garlic, ground thyme, and cayenne pepper in one of the medium bowls. Pour buttermilk into other medium bowl. Heat vegetable oil in Dutch oven on stove top at medium heat. Dip chicken in buttermilk, allow most of buttermilk to drip off back into bowl. Lightly dredge chicken into flour mixture. Lightly brown both sides of chicken turning with tongs. Remove Dutch oven from heat. Add red pepper, onion, garlic, fennel, basil and thyme over the top of the chicken. Place the sweet potato cubes on top making sure they are on top of the other ingredients. Pour Chicken stock over top, then pour wine over the top. Cover Dutch oven and place in pre-heated oven. 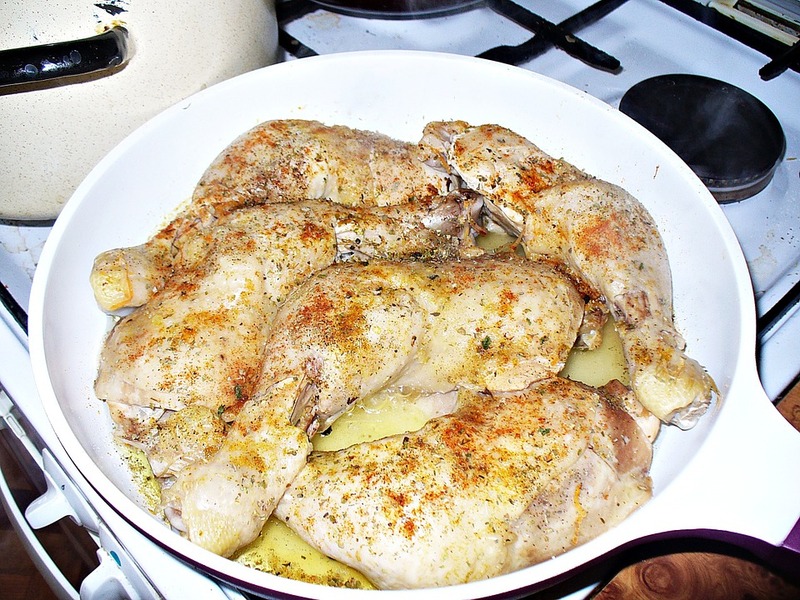 Bake for 1 hour or until chicken is starting to fall apart. Can be served by itself in a bowl or over rice.